Klook offers up to 15% off on Pocket WiFi Rental. The offer is valid until 30 June 2019. Enter the promo code at the checkout to get the offers. Please always check with the merchant on the validity of the promotion before purchase. 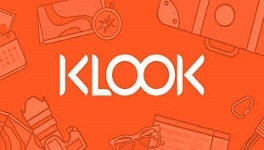 Klook offers up to 5% off on booking travel products at KLOOK with DBS Credit Card. The offer is valid until 31 December 2019. Enter the promo code at the checkout to get the offer. Please always check with the merchant on the validity of the promotion before purchase. Klook offers 5% off on Tours & Sightseeing Activities. The offer is valid until 30 June 2019. Enter the promo code at the checkout to get the offer. Please always check with the merchant on the validity of the promotion before purchase. Klook offers HK$25 off one-off discount for new customers. Newly resigtered accounts can enjoy the offer with the promo code provided. Please check the merchant's website for details. T&C apply. Please always check with the merchant on the validity of the promotion before purchase. Klook offers a one-off HK$10 off promotion for Klook mobile app users. The promotion is ongoing. Please enter the promo code at checkout to get the offer. T&C apply. Please always check with the merchant on the validity of the promotion before purchase. Klook offers three priviledges for HK residents while booking Ngong Ping 360 tickets. 1. Free entry to The Art of Chocolate Museum. 2. Food coupon for designated restaurants. 3. "Skip the line" priviledge when getting on Ngong Ping 360. Please check the merchant's website for details.. Please always check with the merchant on the validity of the promotion before purchase. Klook offers 33% off discount for Taronga Zoo entry ticket. This is an ongoing promo of Klook. Earliest available date is 1 Jul 2018 and 24-hour confirmation is required. T&C apply. .. Please always check with the merchant on the validity of the promotion before purchase. Klook offers 12% off discount for Jurong Bird Park Ticket. This is an ongoing promo of Klook. Earliest available date is today and instant confirmation is provided. T&C apply. Please always check with the merchant on the validity of the promotion before purchase. Grab an extra 5% off on your booking with Citibank Credit Card - Book Now! Klook offers an extra 5% off on your booking with Citibank Credit Card. The offer is valid until 31 March 2019. Get the deal. Please always check with the merchant on the validity of the promotion before purchase. Klook offers one-off discount for Money Back members. Money Back mobile app has to be used to generate the promo code. The discount is up to 75% off. The promotion runs from now until 31 January 2019. T&C apply. Please always check with the merchant on the validity of the promotion before purchase. Klook offers up to 45% off discount with HSBC Cards. The promotion runs from now until 31 December 2018. Please enter the promo code at checkout to enjoy the offer. T&C apply. Please always check with the merchant on the validity of the promotion before purchase. Klook offers up to 75% off discount with HSB Card. The promotion runs from now until 31 December 2018. Please enter the promo code at checkout to enjoy the offer. T&C apply. Please always check with the merchant on the validity of the promotion before purchase. Klook offers up to 75% off discount with DBS Card. The promotion runs from now until 31 December 2018. Please enter the promo code at checkout to enjoy the offer. T&C apply. Please always check with the merchant on the validity of the promotion before purchase. KLOOK PROMOTIONS FOR A MEMORABLE HOLIDAY! Flight tickets checked, hotel checked, travel essentials checked. So you are all booked and ready for a holiday! Want to do as the locals do, yet enjoy the best sights, attractions and activites that a destination can offer? Klook brings you these options and more at special prices. You can even purchase wifi eggs, train tickets and even exclusive fast pass tickets to popular theme parks. You are at the right place here as Cardable HK brings you the best Klook HK promo codes and Klook credit card discounts available for a memorable holiday. Short for "Keep Looking", you can use Klook to discover activities and attractions in a plethora of different destinations! Klook's intuitive website offers in-destination services at a discounted price. Examples include Hong Kong Disneyland, Ocean Park, or the cable car ride at Ngong Ping. You might not know, but Hong Kong is actually the home country of Klook - and thus has lots of fabulous activities and attractions which you can book! Booking is fuss-free as Klook’s award-winning mobile application has up to 30 currency options with seven language services on the application itself. If you prefer to use your laptop, the desktop version of Klook’s site is user-friendly and extremely intuitive as well. The best part about Klook’s website is that you probably won’t feel lost or overwhelmed while scrolling through it. This is because the activities on their home page are carefully curated to make sure users enjoy every single activity at the best price possible. For example, the popular activities section which can be found on Klook Hong Kong’s home page features a few activities which have been booked numerous times by travellers like yourself. Along with the activity, Klook users will receive special discounts. One example is the Peak Tram Fast-Track Combo which is already at a special price. It is rated 4.9/5 stars by users who have previously booked this activity, and is indicated as ‘available tomorrow’. By checking when the discount is valid, you can be sure that you will not miss out on the deal. The Klook Price Guarantee is unlike price guarantee promises on other websites. While other websites promise a top-up of the difference if you find a cheaper ticket online, Klook Hong Kong’s policy is that they will refund DOUBLE the difference! (Terms & conditions apply) You also stand to receive 0.5%-11% of rebate credits when you complete the activity. Other than activities, Klook also offers travel WiFi rental, for when you are on the go without access to data. The WiFi device can be picked up at your own convenience in the city that you are in. A WiFi device is definitely useful - for example, the WiFi hotspot can accessed across the whole of Vietnam. Whether you go to Hanoi or Ha Long Bay, you will still be able to post those Instagram-worthy snapshots to the gram. The 4G device is also compact, and can be taken along in your pocket or in your bag. If you’re travelling as a family or big group, the WiFi device becomes even more value for money! The WiFi offered by the WiFi travel device can be used by up to five devices, and its battery life lasts for four to six hours, making it useful to bring out for the day. If you’re collecting your WiFi travel device from Hong Kong, you can either pick it up at the Hong Kong Airport, or the service centre at Mong Kok. The device can then be dropped off at the same location (Hong Kong Airport) when you return from your trip. The Klook website has a few buttons which will make it easy for you to scroll through the attraction booking and find what you need. They include: package options, what to expect, activity information, how to use, cancellation policy, reviews, and FAQs. However, if you need more inspiration on activities to sign up for while on holiday, you can check out the Klook Blog which has a wide variety of articles that cater to holidays in different countries. For example, The Ultimate Bubble Tea Guide to Taipei which is a listicle sharing about the different kinds of bubble tea in Taipei, a news piece about Tsukiji Fish Market being replaced by the Toyosu Fish Market, and more listicles about spas and massages which you can go to in Phuket for what Klook says will be the Perfect Beach Holiday. Once you click on the article, you will be able to get links to the different activities, making the whole process fuss free. Some of the amazing deals that you can get on top of the Klook discounts include an additional 15% off the pocket WiFi device rental, when you pay by Mastercard. Simply key in the discount code KLKMCW at the payment checkout page in order to redeem. Best of all, did you know that your credit cards can get you some pretty awesome Klook discounts? We got it all covered for you here! Remember that the bank's promo code should be entered at the checkout page while making payment for the discount to be applied. We hope you have enjoyed finding out more about Klook HK. Stay tuned on this page for the latest Klook.hk promo codes, discount codes, or other coupons. Happy Holidays!